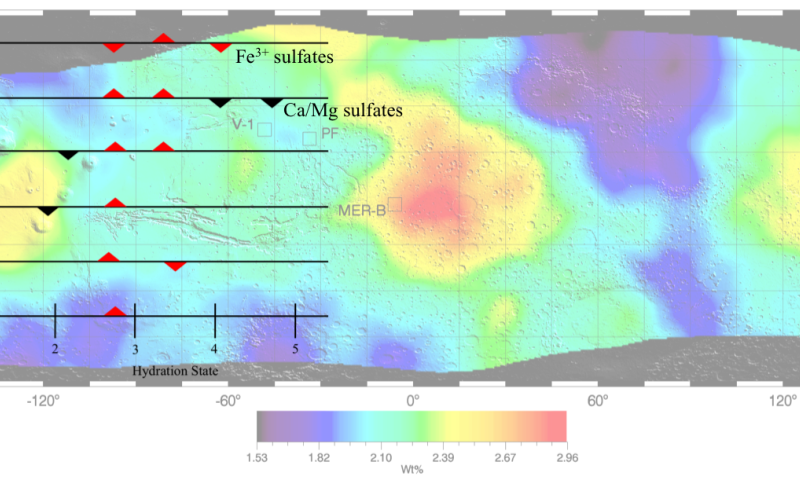 The researchers considered several existing hypotheses in the context of their overall observations, which suggest a meaningful presence of iron-sulfate rich soils, which are wet compared to Mars' typically desiccated soil. This type of wet soil was uncovered serendipitously by the Spirit Rover while dragging a broken wheel across the soil in the Paso Robles area of Columbia Hills at Gusev Crater. Key hypotheses of the origin of this soil include hydrothermal activity generating sulfate-rich, hydrated deposits on early Mars similar to what is found along the flanks of active Hawaiian volcanoes on Earth. Alternatively, efflorescence, which creates the odd salt deposits on basement walls on Earth, may have contributed trace amounts of iron-sulfates over geologic time. A third key hypothesis involves acidic aerosols released at volcanic sites, such as acid fog, dispersed throughout the atmosphere, and interacting subsequently with the finer components of soil as a source of widespread hydrated iron-sulfate salts. Among these hypotheses, the researchers identify acid fog and hydrothermal processes as more consistent with their observations than efflorescence, even though the sensitivity of GRS to elements, but not minerals, prevents a decisive inference. Hydrothermal sites, in particular, are increasingly recognized as important places where the exchange between the surface and deep parts of Earth's biosphere are possible. This hypothesis is significant to the question of martian habitability. "Our story narrows it to two hypotheses, but emphasizes the significance of all of them," said LSU Department of Geology and Geophysics Assistant Professor Suniti Karunatillake, who is a fellow lead author. "The depth and breadth of these observation methods tell us about global significance, which can inform the big question of what happened to the hydrologic cycle on Mars." Too bad if most mineral water is in the south, and most manned missions are targeting the easier to land in lowlands in the north. I am liking the area just east of Valles Marineris more and more all the time. Equatorial region for warmth, dIverse landscape for exploration, proximity to Valles Marineris for exploration and tourism, possible remnant magnetic field for some radiation shielding, and now maybe a source of water. It is also possible this general area contains both past and even future beach front property. Let's go take a look.